Home › Latest News › The World of Helmets! Helmets are without a doubt a key feature for motorcycle riding, but have you ever considered diving deeper in to the wonderful world of helmets? Take it from an experienced rider, helmets are more than just a fashionable add-on to you and your motorcycle. Here in South Africa, there of plenty of good looking helmets but not all helmets serve the same function or have the same benefits or features. When it comes to helmet choices, worldwide, you’ve got a choice of 5 styles, but certain helmets and their features aren’t approved in every country. Here in South Africa, we pass our helmets through European Safety Ratings, known more commonly as an ECE Approval rating. Certain styles like a half helmet/ piss-pot helmets aren’t approved here in South Africa, with that being said, it does not mean that you can’t get one for yourself. Many overseas companies offer these helmets as it’s approved through their safety ratings. Helmets play a massive role not only in lines of protection but also in terms of comfort and usage. For example, there’s no point in going for a long trip all the way to Sutherland, in the middle of winter, and you’re stuck with an open-face helmet. 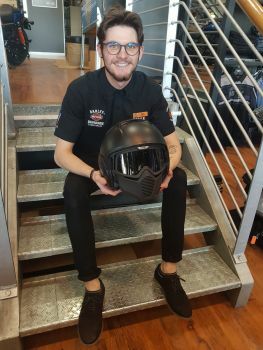 There’s a helmet for each style of riding out there, so whether you’re doing short distance commuting or long-distance touring, Harley-Davidson® Tyger Valley helmets (and their specialist- Dylan) will definitely suit you up correctly! As with any Harley® motorcycle, customization and personal touches make the bike and rider unique. So why not do the same to your helmet? From sticker kits, to additional parts such as smoked-out visors, dome decals, Bluetooth/wired communication systems and many more can be added to your helmet to bring your style and personality to the road. What goes up but never comes down? That's right, age. Helmets age and do deteriorate over a period of roughly 4 to 5 years. Factors that accelerate this process are simple things such as leaving your helmet in direct sunlight for lengthy time periods, moisture within the lining or padding, dust or sand getting into the helmets mechanisms, and the most obvious factors, dropping the helmet or falling with the helmet. A thought that should be in the back in your mind is that even if it’s dropped or fallen on and there is no visible damage, the structural integrity of the helmet could be compromised. If such an event is to occur, try replacing the helmet a year or two before its due date.